Ground fault circuit interrupters (GFCIs) are an important part of your home’s electrical safety. In short, GFCI outlets help protect you from electrical shocks that can occur around water. This nifty device essentially keeps an eye on the amount of electricity coming and going through an outlet or over a circuit. If there is a difference at any time between electricity flowing in on the black wire and back on the white wire, the GFCI wiring suddenly cuts the flow of electricity. Say you’re lying in a bathtub full of water. You’ve been taking a bath, so the water is soapy, salty, and somewhat dirty. While “pure” water really isn’t much of a conductor of electricity, everything IN the water makes is much more conductive. Now say a portable heater you had running nearby fell into the water. The “hot” wires (the ones that carry the flow of electricity to run your fan) get wet. Electricity will take any opportunity it can to move and seek ground, so it jumps across the water and your body and doesn’t return as it used to through the neutral or ground wires in your circuit. The GFCI recognizes this and immediately stops the flow of electricity to the fan and your body! Aside from obvious safety precautions, all housing codes require that GFCI outlets be wired within so many feet of running water, such as in kitchens and baths, as well as outdoors. There are three ways to installl GFCI protection in your home. 1) At your circuit panel, using a GFCI breaker. This will protect the entire circuit on that breaker. 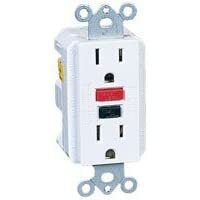 2) At your receptacle using a single GFCI outlet or a GFCI outlet designed to protect that outlet and everything wired after it in the circuit. 3) A GFCI adapter that you merely plug into an outlet. It protects only the receptacle it’s plugged into. Let’s wire a GFCI outlet as in the second way described. After shutting off the main power at the circuit breaker panel, to the area you’re working unscrew the plate on the outlet and set aside. Next, unscrew and pull out the existing outlet if one is there. The wires attached should be carefully unscrewed and/or untwisted. Now, start your GFCI wiring by connecting all black “hot” wires to each other with one going to the GFCI. If your outlet is in the middle of your circuit (meaning, other outlets or switches are wired through it), you may have two black wires coming out of the wall. Ensure the ends are stripped and twist together, using a wire nut, with the black GFCI wire. The black wire going to the GFCI should be connected to the brass screw. Do the same with the white wires, connecting the the GFCI white wiring to the silver terminal. If you purchased a GFCI receptacle that can protect protect other outlets as well, simply connect black/hot wire to the “line” terminals indicated on the GFCI receptacle and the black wires (not hot, because they travel to and connect to other outlets) to the terminals marked “load.” Use a tester if you’re not sure which black wire is the hot lead. Many times, it will be the one on the top of the outlet box, but be sure to check. Be sure and test your GFCI outlets regularly (every few months) by pushing in the test button on the front. The “Reset” button should pop out and that lets you know it’s working properly. Push the “Reset” button back in to return the GFCI outlet to normal. New GFCIs often come with LED light indicators to let you know they’re working too. You may need to swap out your outlet’s electrical box if your new GFCI outlet is a too big to fit inside your existing one. Consult your GFCI wiring diagram that comes with your new outlets if you get stuck.